“This issue [hunger on campus] needs to be solved, to make sure everyone is sufficiently well-fed” – Teresa Shroll. Support Our Students (SOS) is a nonprofit organization that focuses on issues of hunger and food security in the UMass Lowell Community. The cofounders of this organization are three Community Social Psychology students: Mary Tauras ’15, Teresa Shroll ’15, and Sadie Prickett ’15. 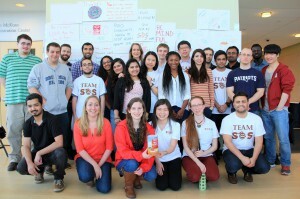 The idea for SOS was initially inspired by their faculty adviser, Khanh Dinh, when she introduced them to programs in Europe, where food products are sold at lower costs for community members in need. Mary, Teresa, and Sadie wanted to do a similar program locally, but realized Lowell already had a local food bank and other programs. Prof. Dinh informed them about the DifferenceMaker program, a competitive program through which they could learn entrepreneurial skills by participating in workshops and various events. Their participation in this program, for which they took the top prize, changed their vision, and they shifted their focus to feeding students on the UMass Lowell campus. The CSP team recruited students from other programs and majors, including psychology (undergraduates), business, nutrition, and computer science. SOS credits its success in large part to the diversity of its team. On both North and South Campus, SOS has worked to bring awareness about food insecurity to the UMass Lowell community, including through game nights, “Hawk Talk: Eat This Not That,” 15 minute class presentations, tabling for donations, and the First Annual SOS Oatmeal Challenge. To ensure the continuing success of the organization, the cofounders have collaborated with over 30 campus and community organizations. Since implementing their program in September, over 1000 students have donated meals and a total of 40 students have been provided meals. Mary, Teresa, Sadie, and team are happy with what the organization has achieved thus far, but feel there is a lot of more work to be done, and they see SOS as a work in progress.